You are here: Home › Lots of New Arrivals! Things can change very quickly around here. As recently as the beginning of last week, we only had a single owl waiting for release. That’s all changed! 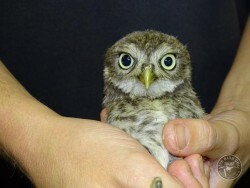 We were asked by Vale Wildlife Rescue in Tewkesbury, if we could help with releasing some owls. While they do sterling work with regard to rescuing and rehabilitating all manner of wild animals, they are not owl-focussed and do not have the same range of release aviaries that we do. Of course, we agreed to help. 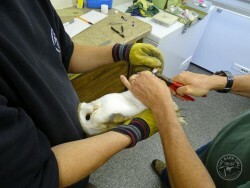 A few days later, four Barn Owls and two Little Owls were dropped off here by one of their dedicated volunteers. These were fitted with BTO rings, as are all the birds we release, as well as colour rings, so we can tell them apart. They are now awaiting release from our three mobile aviaries. Within a few days of these owls arriving, we got calls from two different vets who had juvenile Tawny Owls that had been treated and were in need of feeding up, prior to being released. In less than a week, we had gone from a single owl awaiting release to having nine owls of three different species! The three Tawnies (including Ewok), will be released from our static release aviary here. Check back here for updates on all nine of these birds. 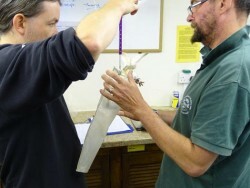 All of the birds were checked over on arrival, this included weighing and measuring. Different species of bird have different sizes of rings. 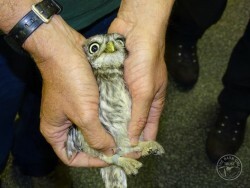 This Little Owl has just had it’s BTO ring fitted.